After a summer of declining invitations to Publican Quality Meats due to marathon training, I finally took advantage and went this past Tuesday (Burger Night is only on Tuesdays). I had gone there once in the past for lunch, and thought the meal was really good, but I kept hearing how the burgers were out of this world. Expectations were high for this meal. 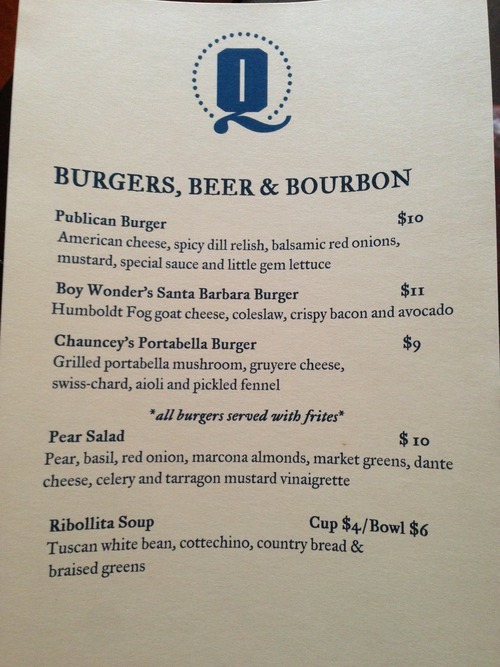 Here is a snapshot of the menu (it sounds like it rotates every so often, but the Publican Burger is a staple). Joyce and I ended up each getting a separate burger and splitting them to increase our opportunities. You can see here what a real connoisseur of food would have done instead, as we were joined once again by the proprietor of Chow-Eng Down. Between the two burgers, I would probably learn towards the Boy Wonder. While both were really good (particularly for the price), I felt like the Boy Wonder had more of the secondary flavors accenting the burger. 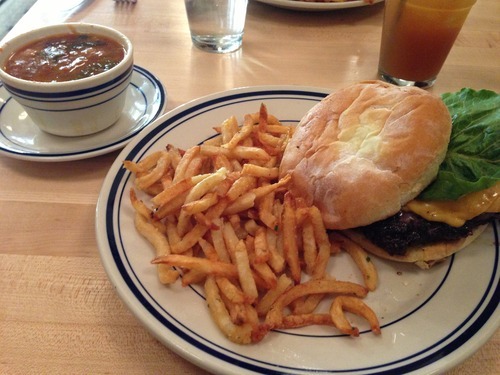 The Publican Burger ingredients tended to blend more together. 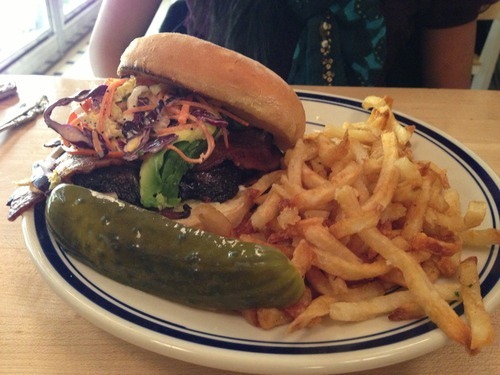 However, I’m a much bigger fan of the ingredients of the Boy Wonder (I would go so far as to say I avoid most of the ingredients on the Publican Burger on a normal day), so the fact that it stood up well on its own says something. The fries were also pretty tasty, though I wouldn’t say they were out of this world. I thought that the Ribollita Soup was really good, though I’m a fan of the ingredients in it. The rumor is that they have had other soups that are even better, marginalizing this one a bit, but since I have never tried the other soups I wouldn’t know. I also ended up getting a “Kentucky Orchard” to drink, which was some sort of mixed drink with spiced apple cider and bourbon but don’t recall what else was in it. It was pretty tasty, as you might imagine. While I would love to continue going every Tuesday night, unfortunately this week was the last week until the weather warms up again. The seating inside only held about 28 people, and if you didn’t arrive right at 6pm the wait started to get rather long considering the outdoor seating was closed. Once they open up again, though, you should definitely add it to your list of places to try.